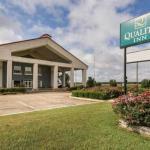 Free breakfast free high-speed internet access and an on-site guest laundry make the Quality Inn Robinsonville a good bet for guests seeking a comfortable place to stay while they hit the slots. The two-story Quality Inn offers 107 rooms with coffeemakers cable TVs hairdryers and irons with ironing boards. Rooms with sofa beds microwaves and refrigerators can be requested. Cruise the web or check your email with free high-speed internet access. The hotel's complimentary breakfast helps guests start their days well fed and caffeinated. Energetic guests can take advantage of the exercise room for a quick workout. Copy and fax services are available. There is a guest laundry on-site. Pooches are welcome for a nightly fee; some restrictions apply. Non-smoking rooms are available. The hotel is located within five minutes of all the gambling you can handle at Fitzgeralds Casino Bally's Tunica Horseshoe Tunica Gold Strike Casino and Harrah's Tunica. Hungry guests also find a variety of dining options within five minutes of the hotel. Shoppers can try their luck at Casino Factory Shoppes outlet mall 15 minutes away. Guests can reach downtown Memphis and catch the blues on Beale Street in approximately 45 minutes. The hotel is 13 miles from Tunica Airport and 37 miles from Memphis International Airport.